As we approach the end of 2016, we’d like to take a little time to note the many practical, stylish and carefully designed garage plans that have been added to our website this year. They vary in architectural style and size and deliver a vast array of special features from storage space to living quarters and everything in between. With so many specially designed garage plans to choose from, selecting the right plan for your needs, preferences, lifestyle and tastes becomes an exciting adventure! Take some time to review this sampling of new garage plans, you might just find the one you’re looking for! 062G-0076 – Do you own an RV, camper or motor home? This modern RV garage plan is just right when it comes to protecting your investment. It offers an RV bay outfitted with a 12’x14’ overhead garage door and a vaulted ceiling. A single garage bay is positioned beside the RV bay. It offers a 12’x7’ garage door and it is 30’ deep providing room for boat storage or just extra storage space in the rear of the bay. Upstairs you’ll find a loft/studio that is ideal for hobbies or storage. Add value to your home and protect your “home away from home” when you’re not on the road with this RV garage plan. 023G-0 003 – For those who need extra parking and a little extra living space, consider a garage apartment plan like this one. This Craftsman style 2-car garage plan features a double bay plus room for a workshop, game area or storage space on the main level. There is also room for a stackable washer and dryer under the stairs and plenty of windows on the right side filling the space with natural light. Upstairs, a comfortable apartment delivers 754 square feet of living space featuring a compact kitchen overlooking the living area, a generously sized bedroom and a full bath. Ideal for weekend guests or your college student, this garage apartment plan offers private living space close to the main home. It is also a good alternative to a hunting cabin, lake house or vacation home. 051G-0087 – For those who need extra parking plus a little storage space for basement or attic overflow, a garage plan with loft is the ideal solution. This garage loft plan features a gambrel roof and a 24’x25’ footprint while delivering 600 square feet of sheltered parking space. A couple of windows offer natural lighting inside and a side-entry service door provides convenience. Use the loft to store seasonal items and holiday decorations. 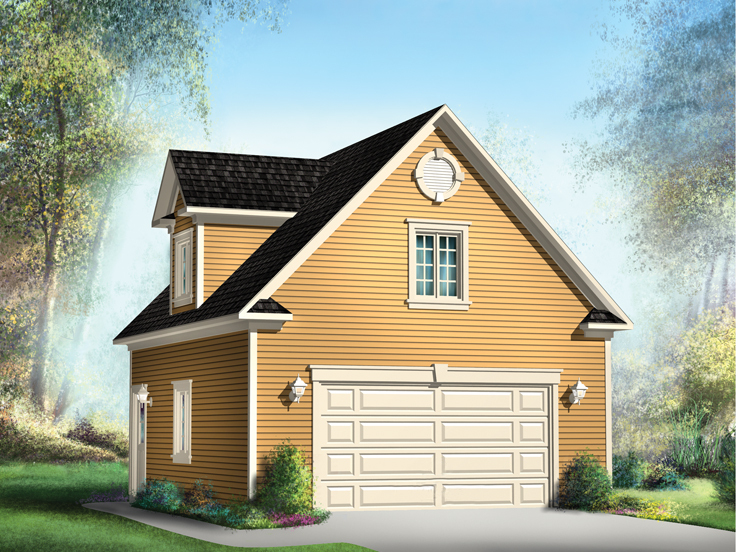 072G- 0016 – Add extra parking and storage space to your home with this detached, 2-car garage plan with loft. It is available in six different sizes allowing you to build a garage that fits your lot. The could garage offers one overhead garage door and service entry on the side. Interior stairs lead to the second floor loft where a dormer offers natural light. The loft is ideal for a game or hobby room, workout area, home office or just plain ole’ storage space. 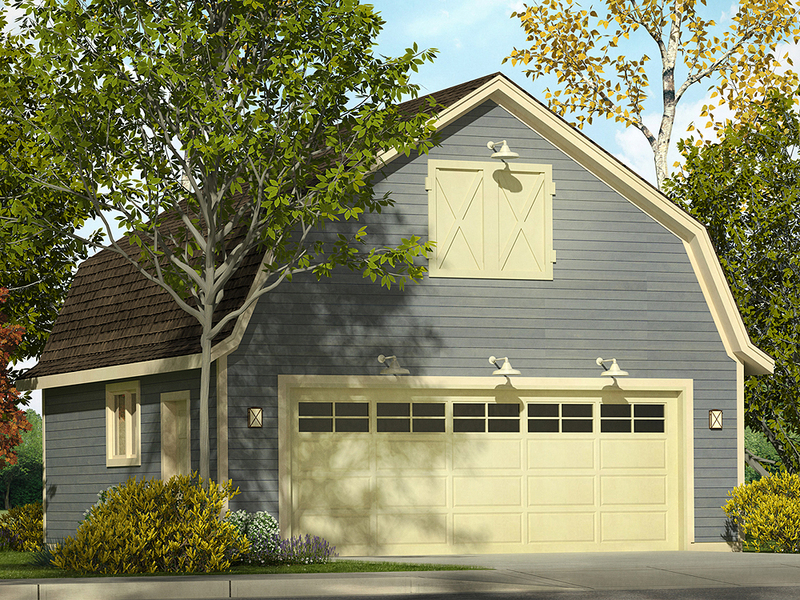 This flexible 2-car garage plan with loft offers options and convenience. 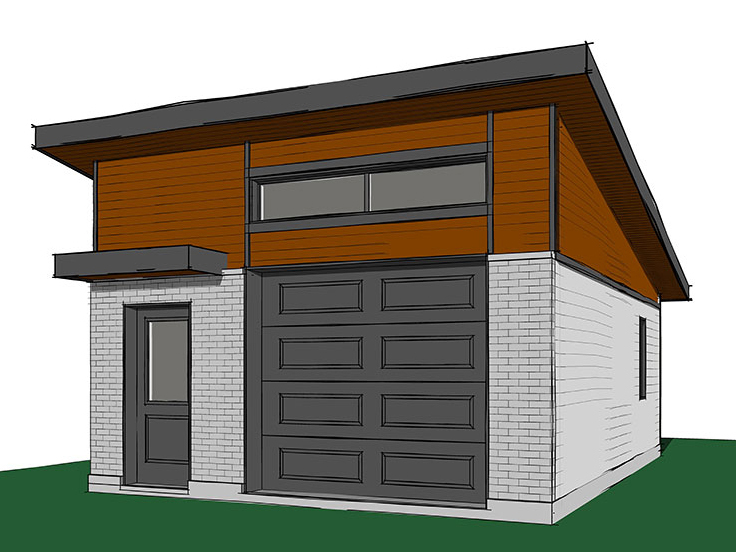 028G-0059 – Need a modern garage to match your modern home? 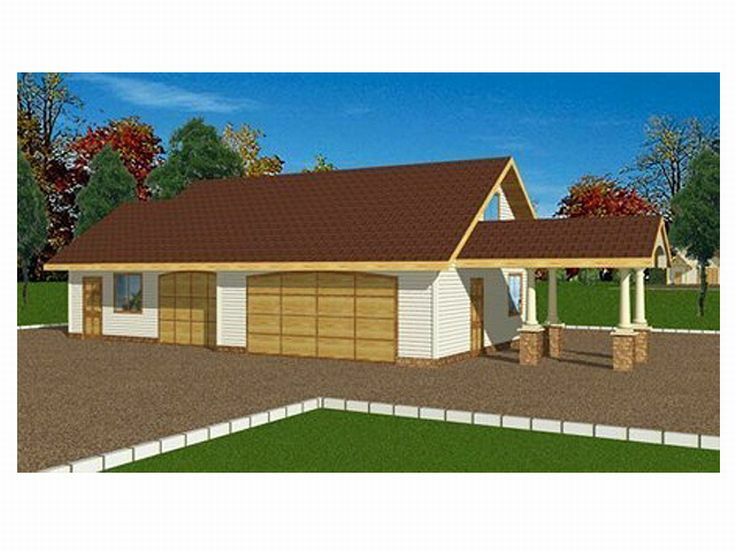 This detached 1-car garage plan might be just right for you. Its modern design is clean and simple offering a pair of windows and service entry. An overhead door opens to 432 square feet of parking and storage space. If you have a tight lot, this 18’x24’ garage plan could be a good option for you. 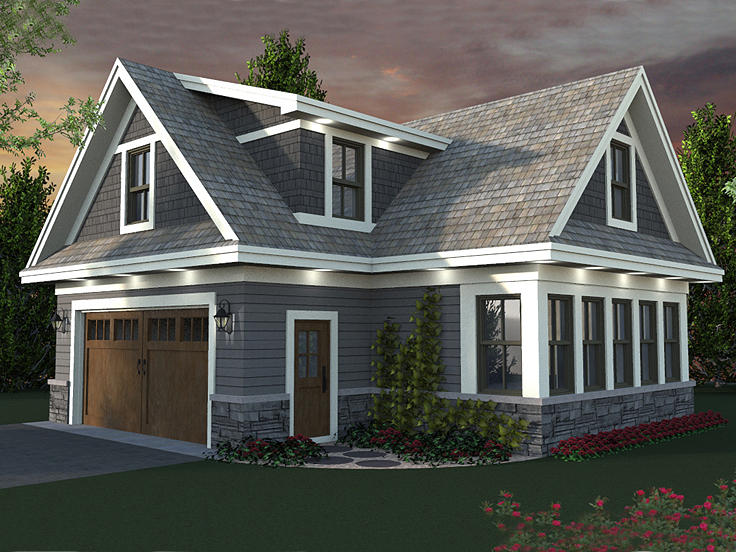 012G-0129 – Here’s a detached, 3-car garage plan with plenty of extras! In addition to three garage bays, this special garage offers a workshop with its own overhead door making it easy to move tools and supplies in and out of the garage without a hassle. Interior stairs lead to the finished flexible space on the second floor. It is designed as an art studio complete with clay oven, counter space, sink and a full bath. Having a dedicated workspace for hobbies will allow you to work on projects and let them sit when it is time to do something else. This eliminates the need to clean off the snack bar or dining room table when it is time to prepare, serve or enjoy a meal. The art studio is flexible enough that it could easily be finished as a home office or guest suite if you prefer. 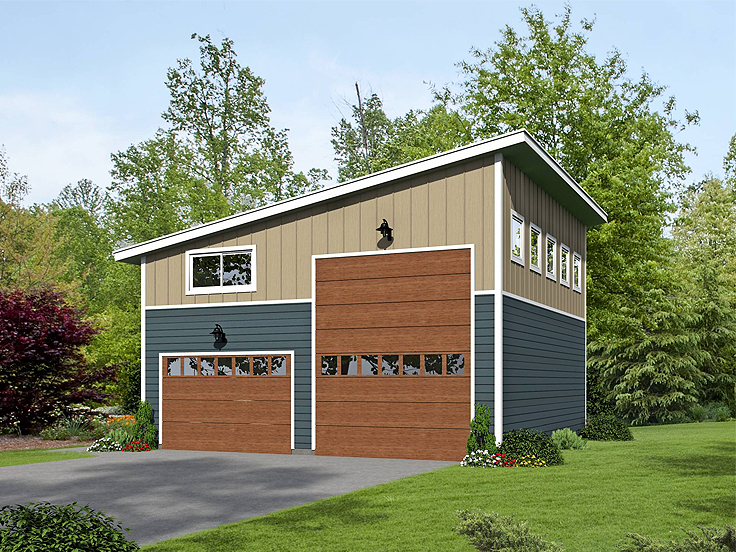 Designed to accommodate several needs at once, this 3-car garage plan with flexible space is hard to resist!